I’m going to do something a bit different for this blog. 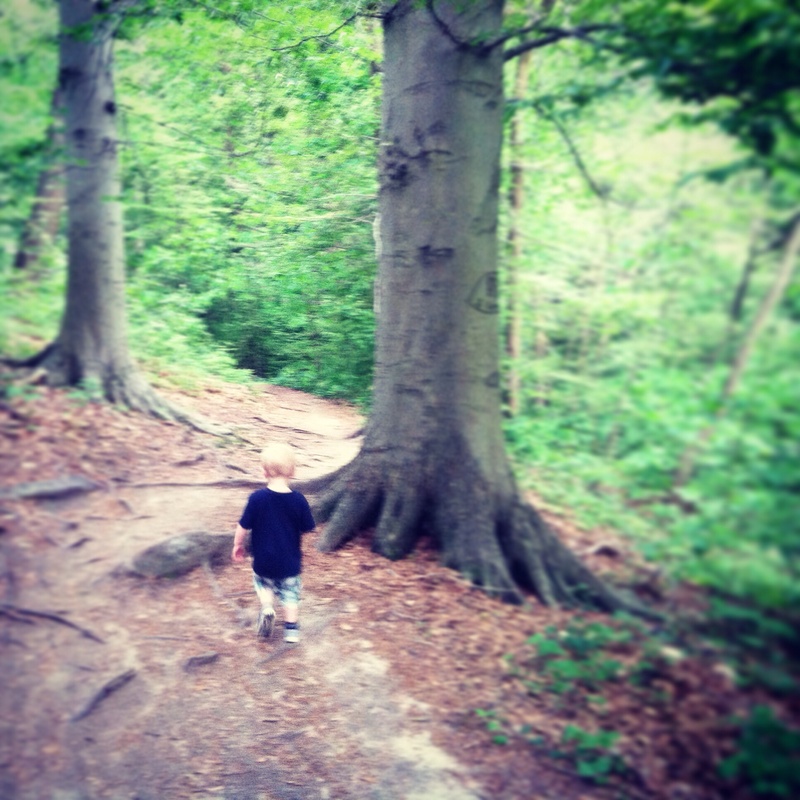 Normally, this blog is about my personal adventures and experiences. I’m about to take a page from my other blog’s book, and write about a health/safety/medicine-related topic. Incidentally, if you’re interested in this sort of thing, take a glance at Mountain Rescue Blog; I talk frequently about outdoors related medical and rescue related incidents. When I say the phrase “Poison Ivy,” what images and emotions does this bring to mind? For me, it brings to mind a childhood spent itching. I have always been very sensitive to its effects. In fact, the running joke in my family is that I can get poison ivy simply by standing downwind from it. Not quite true, but it sure felt like it growing up. In my time as an outdoor enthusiast, I’ve spent a lot of time with folks who know nothing about poison ivy, with those who think they know something about poison ivy, and those who are self-professed experts on the subject. I’ve heard all sorts of schemes about how to identify it, some of which are quite complicated. Most of these involve somewhat fuzzy rules like “poison ivy has leaves with red on them somewhere,” or “poison ivy has notched leaves.” The problem with these is that a) neither are always true, and b) they require a great deal of interpretation. Step 1: Does the Plant in Question Have Three Leaves? Everyone knows this one. “Leaves of three, leave them be” is the only identifying feature of poison ivy that many are taught. Poison ivy always has three leaves; any other number is not poison ivy. So, 1 leaf, two leaves, four leaves, five leaves, it really doesn’t matter. Three is the magic number. Step 2: Does the Plant in Question Have No Thorns? Poison ivy does not have thorns. I will repeat myself for emphasis: Poison Ivy Does Not Have Thorns. If the plant in question has thorns, it is not poison ivy. There is a plant in the area I grew up called the bramble which looks very much like poison ivy (including three leaves). The only significant difference is that the bramble has thorns, while poison ivy does not. Step 3: Does the Middle Leaf Have its Own Stem? This one requires you to look closely (not too closely…). You want to find the middle leaf of the group of three. It should have its own extended stem which holds it out from the two side leaves. The two side leaves should attach directly to the central stem. This is important as it separates poison ivy from several other species which have three leaves and no thorns, but have the middle leaf attached directly to the central stem. You can see what I mean in the picture below. 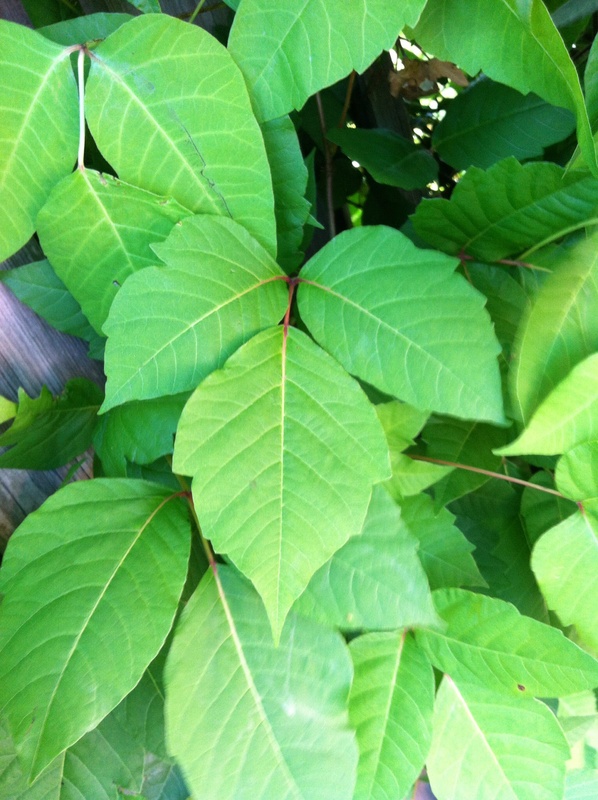 Classic poison ivy: Three leaves, no thorns, center leaf on its own extended stem. That’s it. It’s as easy as identifying these three features. If the answer to all three questions is “Yes,” then the plant in question is poison ivy. If the answer to even one of these questions is “no,” then the plant is not poison ivy. It’s that simple. Poison ivy presents in several other ways. Poison ivy can present as a bush, an isolated ground plant, or as a vine which climbs a tree or other structure. When the vine climbs something, the vine looks like its covered in hair. This led to the expression in my parents house that “vines that are hairy are scary!” Poison ivy can also have berries if it grows large enough. There are some other features that some have used to identify poison ivy. The problem with these is that they are often true, but are not universally true. So, I’ve included a few of those too, with my reasons for why they should not be used to identify poison ivy. 1. “Poison Ivy always has notched leaves. If the leaves aren’t notched, it’s not poison ivy.” This is actually not universally true. 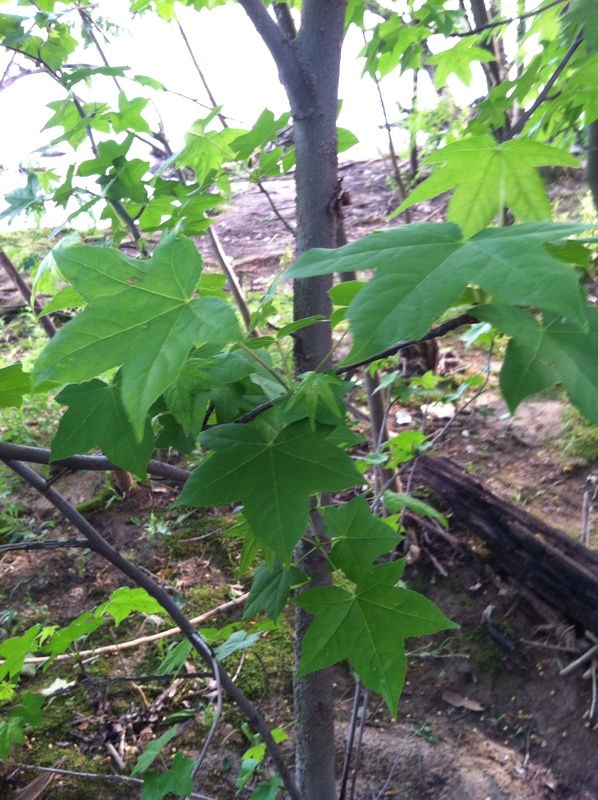 While some poison ivy plants do have notched leaves, not every plant will have them. In fact, I’ve seen poison ivy plants where some leaves are notched, while other leaves attached to the same plant are smooth. I’ve included a picture showing just this phenomenon here. One plant, all clearly poison ivy, but great variation in the shape of the leaves. The notches are certainly something to keep in mind, but they should not be thought of as a universal feature. Notice the great variation in leaf shape. Some are notched along the outside edges; others are smooth. Do not rely on leaf shape as your definitive identifying factor! 2. “Poison Ivy always has a reddish tint to the centers of the leaves or the stems.” Also not universally true, but true enough that it has become fairly well trusted. I’ve certainly seen poison ivy with a reddish tint that would fit this description. However, I’ve also seen just as much poison ivy that is deep, deep green with no hint of red. Again, something to be aware of. But maybe not something to base your identification off of. Flatly not true. Poison Ivy grows up trees quite happily. In fact, the vine can sometimes take over the tree, and send out vines which look like branches. It ends up looking like a poison ivy tree. So, let’s see if you can use my rules to identify some poison ivy. I’ve included some pictures that I’ve been taking around Richmond (this has made my work partner laugh at me a bit; I view it as being for the common good). You might be deceived if you just look at the tip of the plant. It has no thorns, and the middle leaf does appear to have an extended stem. 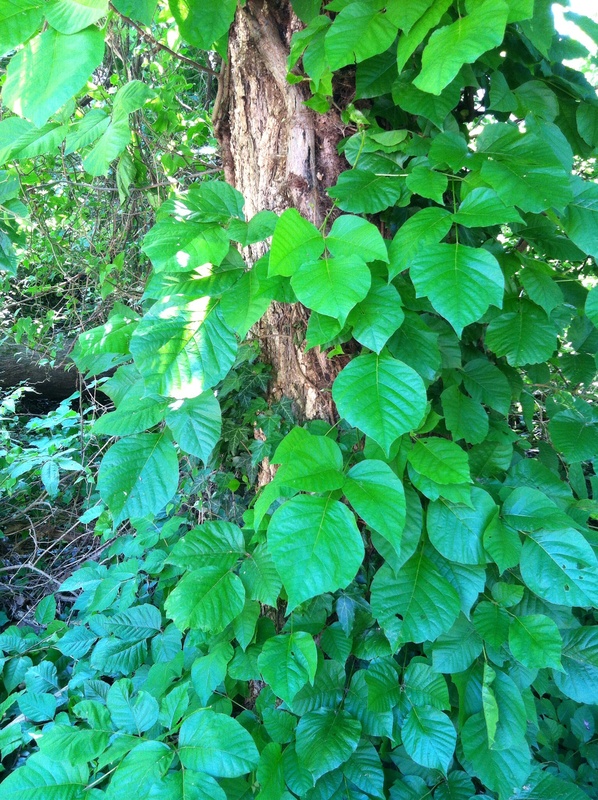 However, it has more than three leaves, so this is not poison ivy. The shape is very similar, and it does not have thorns. However, it only is one leaf. Additionally, what would be the middle leaf does not have its own stem. So this is not poison ivy. This is a trick question, and actually a pretty important teaching point. This picture has Poison Ivy in it, over there on the left side of the picture. The plant on the right side, however, is not. Notice that it has extended leaves, and no thorns. Also the leaves do generally look like poison ivy leaves. 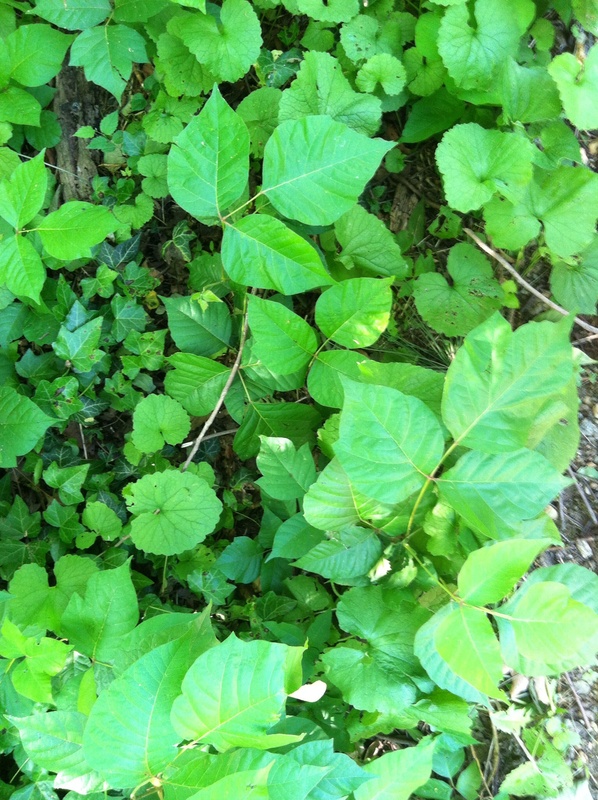 However notice that this plant has five leaves, which means it is not poison ivy. 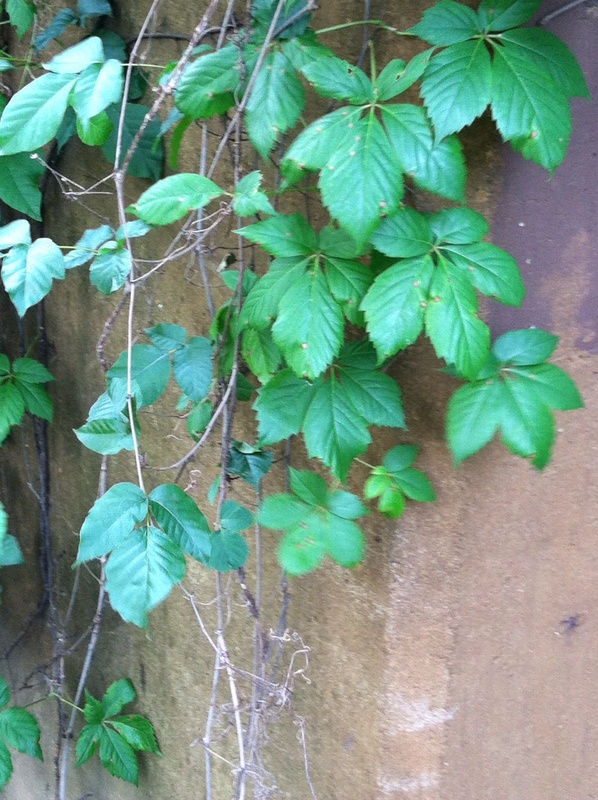 This five-leaved plant is called Virginia Creeper, and it is very common. In fact, it grows in the same places as poison ivy. So generally, if you see Virginia Creeper, keep your eyes open because, chances are, there is poison ivy somewhere close. Three leaves? Check! Extended middle stem? Check! No thorns? Hard to tell from this distance, so I’ll just tell you. Check! This is indeed The Evil Weed. Note how there is not a hint of red anywhere in the leaves or stems, and that while some of the leaves are notched, just as many are not. The leaves are shiny due to the oils which cause the rash we all know and love. Sure looks like poison ivy, huh? No thorns? Extended middle stem? It even has a reddish tint to the middle stem and notched leaves. What about three leaves? This is another trick question. Several of the leaf clusters do indeed have three leaves. However, if you look closely, you’ll see that the lower, more mature leaf clusters have five leaves, which means that this is not poison ivy. Poison Ivy isn’t really poisonous. What gives you the rash is an oil or resin secreted by all parts of the plant (root, stem, leaves, berries, and vine) called urishiol. Urishiol essentially causes an allergic reaction (the technical term is dermatitis) which is the uncomfortable rash with itching and weeping that we experience when we get involved to closely with poison ivy. The allergic reaction can vary by how susceptible individuals are. My grandfather never got poison ivy, and claimed it was because he had Cherokee in his lineage. On the other hand, I got poison ivy like it was my hobby. You can get poison ivy externally on exposed skin. More worrisome, you can also get poison ivy internally if you inhale or ingest the oils. This typically happens when poison ivy or materials which have urishiol on them are burned. The oil is sent into the air in the smoke, and if inhaled can cause inflammation in the airway. Don’t underestimate this; it can actually cause critical injuries and sickness (the idea of this used to scare the crap out of me when I was a wildland firefighter). So, make sure you look at where you pick your firewood up from, and check your firewood before you toss it in the fire. 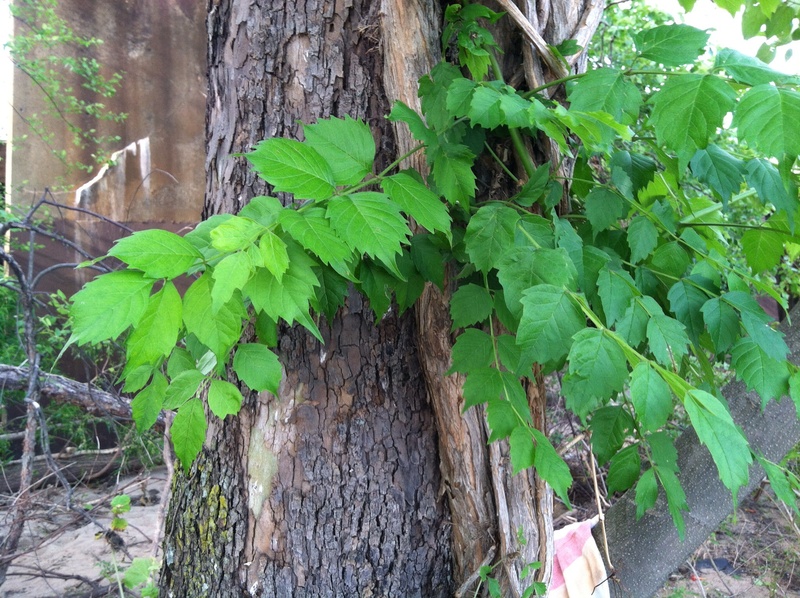 Avoid firewood in thickets of poison ivy, and logs which have hairy vines growing on them. 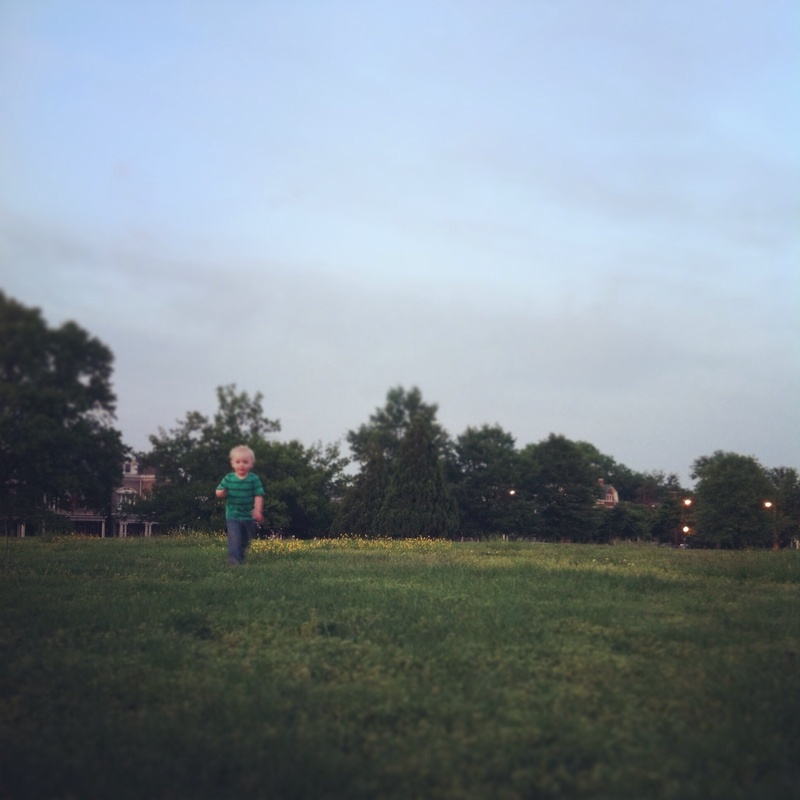 Coming in contact with poison ivy is not the end of the world. In fact, preventing poison ivy after contact is relatively straight forward. Basically, you have to clean the urishiol oil of yourself, your equipment/clothing, or your pet as quickly as possible before it causes an allergic reaction. The best way to do this is to take a shower within about two hours of exposure; sooner if possible. It is best to take a cool or cold shower, as this causes the pores in your skin to close and is thought to make the oil not absorb into your skin as well, and just rinse off the surface. I also recommend using a detergent to clean your skin instead of a soap. Because of the physical properties of oils (the same properties which cause the oil and water/vinegar in your Italian dressing refuse to mix), plain water and soap are not fully effective at removing oils from your skin. Detergent is able to stick to both water and oil at the same time, and removes the oils much better. You can also use a commercial product to clean your skin. I swear by Technu, which smells awful but does the job very well. Basically, swab the exposed part of your anatomy (exposed to poison ivy, you dirty-minded fool, you) with the stuff, let it sit for 5 minutes or so, then wash it off. Technu can also be used to clean your pet, where it is used much like a shampoo. Cleaning clothing and equipment is fairly easy. Clothing can be washed. The washing machine with detergent is pretty effective at removing the oils. Technu can also be used to wipe down equipment and can be put directly in the washing machine with clothing. Bear in mind that if you do not wash your boots/equipment and the poison ivy oil remains on them, you can get poison ivy after the fact if the oils transfer to your skin. Getting poison ivy, if its bad enough, may actually be worse than the end of the world. The key is to catch it early. And don’t scratch. Therapy focuses on relieving the it, and getting rid of the rash by drying it out. I’ve found that cleaning the rash with Technu, allowing it to sit on the skin for five minutes, and then washing the Technu off dries the rash out, causing it to disappear within about a week. I usually then follow up after the Technu with a local anesthetic cream which removes the itch. Products like the old standby calemine lotion, or topical benedryl compounds work very well. There are also some commercial products made specifically for this on the market, such as “Ivy Foam,” which I found works very well. If the rash is bad enough, persists, or is in (shall we say) uncomfortable or important areas, or if it somehow got into your airway or esophagus, you should go see your doctor. He or she can treat it with steroids which would clear it up fairly quickly. Basically, I hope this gives you a tool you can use. 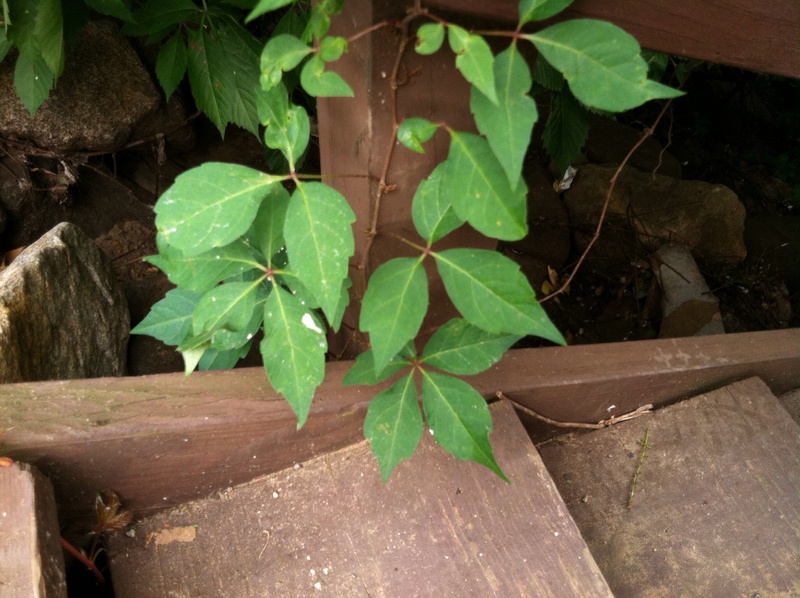 If you have questions, or pictures of plants you think are poison ivy but are not sure, feel free to email me. EDZook@gmail.com.